Ruth Morgendorffer is the Mother of Jake Morgendorffer and widow of "Mad Dog" Morgendorffer, seen only in "Jake of Hearts". Ruth is voiced by Stacy Brass. "The Daria Diaries" states her birthday is on October 24th. Ruth was a traditional housewife who stayed at home and raised her children, hence having a view that a woman's place is at home. This is shown as one of the reasons of her dislike of her daughter in law Helen, who she sees as neglecting her husband because of her work. 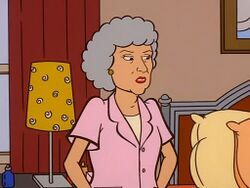 She also discourages her granddaughter Quinn Morgendorffer of becoming a doctor, saying she should marry one instead. She has limited interaction with Daria, and once offered her money to change her hairstyle (as apparently did Grandma Barksdale). Ruth seems to have suffered (and still suffer) as much as Jake from the bullying of her husband "Mad Dog". In the episode Jake of Hearts she first describes him as a decent man but later starts remembering his faults (including never having been given enough money to care for the house and children). She apologizes to Jake for never having stood up for her son against him, admitting that she would do a lot of things differently if given the chance. Daria later reminds her of this comment when she's criticizing Helen and Quinn, and Ruth decides to leave, realizing her visit is causing more harm than good. Ruth is also mentioned in "The Daria Diaries." Jake's letters home from military school say he forgives his mother for sending him there, since he knows she could never say no to Mad Dog. Jake's diary also reminds him of Ruth's birthday: "leave message on her machine." He doesn't seem to have kept up much contact with her until his heart attack. Ruth is noticeably shorter than Daria and possibly the shortest adult seen in the series. This page was last edited on 2 June 2013, at 07:23.